On 15 and 16 May, SCA International Symposium "Science and Technology for Culture" was organized by Institute of Technology Cambodia (ITC), Ministry of Education, Youth and Sport of Cambodia, Ministry of Culture and Fine-Arts of Cambodia. The International Symposium was composed of 4 keynote lectures, parallel sessions and a panel discussion. It was attended by 174 participants from 16 countries/regions. On 16 May, SCA Joint Project Workshops was held and four lectures on the topics related to Cambodia and the world were presented. At SCA Management Board Meetings convened during the three-day Conference, applications for new SCA membership from Pakistan Academy of Sciences (PAS) and Indian National Science Academy were unanimously approved. The total number of member organizations expanded to thirty one. 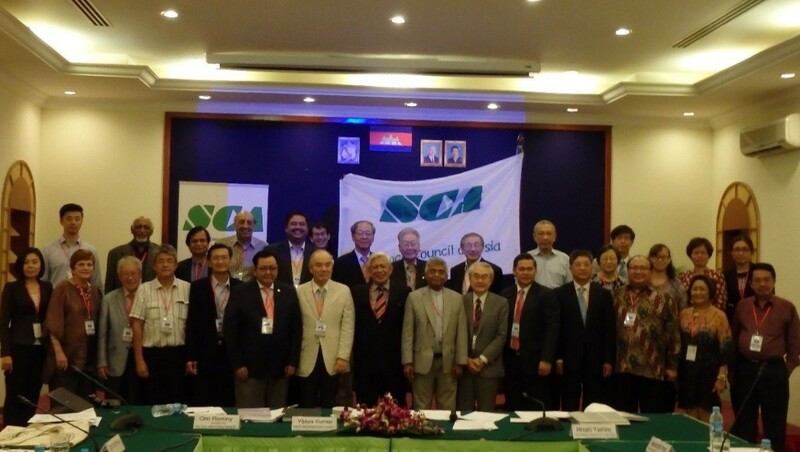 The Science Council of Asia at its 15th Conference held at Siem Reap, Cambodia expressed its profound sadness at the unimaginable disaster caused by the massive earthquakes that occurred recently in the Kathmandu-Pokhara area of Nepal. It resolved to convey its condolences and sympathy to the Nepalese people for the colossal loss of life and infrastructure in their country. We anxiously continue to monitor reports of the effects of earthquakes on Nepal and hope that these will soon subside with the minimum of adverse consequences. We are sure that the Nepalese government and the international community are involved in the recovery process and doing their best to alleviate the situation, a process which we realize is both challenging and enduring. We truly hope and pray that the people of Nepal, with utmost courage, solidarity and resilience, will recover resurge from their present hardships and achieve normality in the very near future. We, the SCIENCE COUNCIL OF ASIA (SCA), resolves to work with Nepal, its academy of sciences and other scientific institutions in the country and Asia to utilize all that science has to offer to effectively respond to the present crisis and to any future large-scale natural disasters that continue to threaten the safety of our peoples and societies. Culture provides the basis for understanding the environment one lives in, including relationships with others and the values one upholds. It is only through the retention of customs and traditions that uphold the values of non-discrimination and inclusive development that one can achieve progress truly appreciated by the people. The abundance and diversity of culture found in Asia underlines the importance of these issues to this particular region. Modernization with developments in Information and Communication Technologies (ICT) include rapidly improving personal information communication devices popular with the youth and a global distribution system which quickly spreads these developments. These serve to promote the spread of universal common values in the daily lives of peoples rather than respect the differences and diversities of a particular region. There is therefore a need to preserve and, even at times, recover cultural elements which have been lost or destroyed over a period of time. Furthermore, there is a need to protect and promote the various peoples’ historical and cultural heritage, both tangible and intangible cultural property, and to support the traditional artists and artisans who contribute to their preservation. The SCA recognizes the centrality of indigenous cultural values and social structures, particularly the rich cultural diversity of Asia, while fostering the ethics of rights-based development, gender equality, inclusive development, and human well-being, in the application of science and technology especially in the spheres of food, shelter, health care, education, and environmental preservation. It is in the interests of most Asian countries to mobilize their maximum efforts for the preservation and recovery of their cultural sites. They usually play an important and expanding role in the strategy of utilizing tourism to finance their economic development. Scientific and technological programmes have been playing and could play a successful role in the preservation and recovery of culture and heritage sites in many nations and regions. Furthermore, encouraging the digitization of cultural heritages and promoting universal access through the global network of information in the public domain could increase awareness and contribute to the protection of cultural sites. Science and technology institutions in developing countries and regions could be the driving force to promote the utilization of Science and Technology in preserving culture while exploiting S&T and culture for national development. Regional institutions could also provide a platform for reinforcing the voice of developing countries on issues related to science, technology and culture. Cultural sites usually are settings within complex societies which have evolved in ancient times from simple settlements to comprehensive civilizations with well-developed components like housing, hospitals, markets and schools. A study of these sites can provide us with insights on that period, particularly on social practices and on indigenous science, technology, architecture and engineering. In conserving and developing cultural heritage, it is important to take into account the existing culture and character of the local community when making changes in order to avoid conflicts and tensions. Science and Technology development has to be complementary to cultural advancement. In order to achieve cultural advancement together with science and technology development, the people belonging to a particular society should be made aware of and recognize the importance of their unique culture and respect the function of culture in society when making decisions on strategies for national development. All initiatives in this area should aim at achieving sustainable development without unnecessarily sacrificing the unique culture of the region. In preserving the culture and traditions including the indigenous technology and local wisdom of a thriving community, science and technology development should be in harmony with the local wisdom and technology. Recognizing the study of traditional knowledge, in particular that of indigenous peoples of the region in relation to environmental protection and the management of natural resources, can help foster synergies between modern sciences and local knowledge. Promotion and implementation of this win-win situation with respect to unique culture and science and technology development requires the strengthening of capacity of developing nations. This should ensure the availability of the appropriate human and material resources to enable inter-disciplinary collaboration between different academic fields. Sustainable development while maintaining the unique culture of the region requires the committed leadership of all stakeholders to be aware of the importance of respecting the culture of the region. It is important to foster the development of networks of historical and cultural heritage sites to preserve culture and tradition in a sustainable manner, while expanding their contribution to regional economic development. International and regional organizations are encouraged to initiate collaborative studies and provide assistance for capacity building to utilize science and technology in these areas. They also include techniques for the preservation of cultural sites and for undertaking research to understand the society that existed at that time.